Personalized medicine and precision medicine are easier to conceptualize than define, and implementation can be even more challenging. 3D printing has intersected medicine to enable both. Personalized medicine is now delivered by “clinical modelers”, impassioned investigators are caretakers who model disease with 3D printing to define pathology, plan intervention, and treat patients. Creating, manipulating, and printing Standard Tessellation Language (STL) files is challenging; generating a hand-held model from a CT scan is harder than it has to be. Several diagnostic post-processing steps applied to the CT volume (collectively termed “3D visualization”) must be repeated to generate an STL file that is then 3D printed. Multiple software packages are typically required before the STL file is electronically placed on a separate build-tray software platform. In 5 years or less, the inefficiency of medical modeling will be a historical footnote. Current 3D printing publications are disparate. My group’s summary of the literature (submitted for publication in October 2014) attempted a comprehensive survey of the field stratified by organ section . I personally apologize if your article was not included. However, those papers we did find and include spanned over 50 different journals. 3D Printing in Medicine is designed to provide a common platform peer-review platform. This forum is long overdue. The journal also addressed another missing piece: STL files are invited for submission and can be downloaded for free consumption by our readership. Those engaged in 3D printing are talented, and their creativity should be rewarded with development opportunities. 3D Printing in Medicine invites not only clinical studies, but also “concept papers” that will motivate and connect physicians, industry, engineers, and scientists in general. These papers will benefit from peer review and serve as a platform for funding that will drive further innovations. 3D Printing in Medicine will promote literature standardization. Currently publications incompletely report methodology, limiting reproducibility and careful assessment of appropriateness. The journal will adopt a format for standardized enhance communication. A template format would include the following: printer type, materials, time to print (assuming the object was printed by itself), estimated cost of the materials, and potential overall cost to fabricate the model. Reporting should also include details regarding the print layer thickness and details regarding imaging if the model was created from DICOM images. Precision remains critical for diagnoses and treatment. An early journal article addresses STL file precision to open a conversation among clinical modelers regarding best practice strategies . Many clinical modelers are our trainees and academic junior staff members who have embraced 3D visualization. I welcome this talented, enthusiastic group to explore 3D Printing in Medicine and translate their inventive spirit to the clinical and scientific communities, and, in the process, make meaningful contributions to improve healthcare. Cai T, Rybicki FJ, Giannopoulos AA, Schultz K, Kumamaru KK, Liacouras P, et al. The residual STL volume as a metric to evaluate accuracy and reproducibility of anatomic models for 3D printing: application in the validation of 3D-printable models of maxillofacial bone from reduced radiation dose CT images. 3D Printing in Medicine. 2015. in press. The organ printing technology introduced decade ago is an automated, robotic and computer-aided layer by layer additive biofabrication of functional 3D tissue and organ constructs using living tissue spheroids as building blocks. The organ printing technology consists of three main steps: (i) pre-processing or design of blueprint for bioprinting of human organ; (ii) processing or actual 3D bioprinting using bioink or tissue spheroids, biopaper or bioprintable hydrogel and bioprinter or automatic computer-aided robotic dispenser; and (iii) post-processing or bioreactor-based accelerated tissue maturation. Organ printing is a rapidly emerging technology. The past, present and future of organ printing will be discussed. 4. 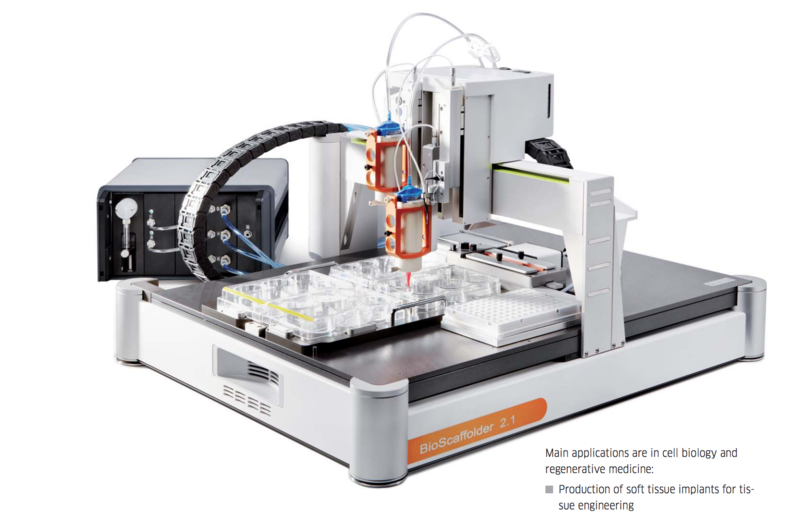 3D Bioprinting Solutions’ FABION – Stem cells within hydrogel. Rokit: Plan: 3D printing human skin for burn victims. Kadimastem Ltd. Kadimastem is a biotechnology company focused on the industrial development and commercialization of human embryonic stem cell (hESC)-based products…. Beauty-Cell Ltd. Collection, processing and storage of mesenchymal stem cells from fat. Life Bank – BioCord Ltd. Cord Blood Banking. Joachim Kohn is a leader in biomaterials science and widely known for the development of tyrosine-derived, resorbable polymers, one of which is now used in an FDA-approved medical device. Kohn’s current research efforts focus on the development of a new “discovery paradigm” for revolutionary biomaterials using combinatorial and computational methods to optimize the composition and properties of biomaterials for specific applications, particularly tissue engineering and drug delivery. As a first demonstration of the utility of this approach, Kohn led a team of scientists who discovered an optimized polymer for use in a fully degradable cardiovascular stent which has been tested in clinical trials in Germany and Brazil. Additional clinical trials are planned. Kohn’s combinatorial biomaterials design approach was also used for the development of optimized polymers by Lux Biosciences (ophthalmic applications) and by Trident Biomedical (orthopedic applications). Yi Arnold, PhD, is currently a senior scientist at Osiris Therapeutics, Inc. She obtained her PhD in Biomedical Engineering from City College of New York and followed by a postdoctoral training at Yale Medical School. After that, she joined the Laboratory for Stem Cells and Tissue Engineering at Columbia University and performed research on cardiac tissue engineering. Before joining Osiris, she worked as a senior scientist at Kinetic Concepts, Inc.
Matthew Becker is a Professor in the Departments of Polymer Science and Biomedical Engineering at The University of Akron. His research group focuses on synthesizing highly functional macromolecular materials for medical device and regenerative medicine applications. He is the Director the industrially-focused Akron Functional Materials Center and also leads the Biomaterials efforts of the Austen Bioinnovation Institute in Akron. Prior to joining UA, Dr. Becker was a project leader and NRC postdoctoral fellow in the Polymers Division of the National Institute of Standards and Technology (NIST). He also led the biomaterials efforts of NIST Combinatorial Methods Center and facilitated Polymers Division interactions with the research divisions of the U.S. FDA. Dr. Becker received his PhD in Organic Chemistry in 2003 from Washington University in St. Louis under the supervision of Professor Karen L. Wooley where he was an NIH Chemistry-Biology Interface Training Fellow. He received his BS in Chemistry in 1998 from Northwest Missouri State University. Scott P. Bruder, MD, PhD, is an insightful and energetic healthcare leader with a 20-plus year history of bridging basic science, clinical medicine, and industrial development expertise to deliver innovative, commercially successful products that improve patients’ lives around the world. Experience in medical devices, diagnostics, biotechnology, and life science research tools fortify an expansive analytical skill set for this resilient, poised and influential C-Suite executive. An award-winning scientist and clinician, equally comfortable in the laboratory, at the lectern, in the Boardroom or on Capitol Hill, he delivers impactful results by inspiring multi-disciplinary teams to be collaborative, rigorous and decisive. This seasoned Senior Executive, University Professor, and FDA Advisory Committee Member provides a unique bench-to-bedside perspective on unmet needs, development strategy and the path to commercialization. An avid long-distance runner, jazz pianist, devoted husband and dedicated father, his core beliefs are based on the principles of passion, commitment and discipline. Christopher S. Chen is a Professor of Biomedical Engineering at Boston University and the Harvard Wyss Institute for Biologically Inspired Engineering, has been instrumental in developing engineered cellular microenvironments to understand how cells build tissues. He serves as a fellow for the American Institute for Medical and Biological Engineering, member of the Faculty of 1000, Editorial Board for Science Translational Medicine, Annuals Reviews of Cell and Developmental Biology, and Developmental Cell. He received his Ph.D. from M.I.T., and M.D. from Harvard Medical School. He was founding director of the Penn Center for Engineering Cells and Regeneration before his current appointment. Marcus Cicerone is a Project Leader in the Polymers Division of the National Institute of Standards and Technology. He received his Ph.D. in Physical Chemistry at the University of Wisconson-Madison. Over the past 9 years he has led a team of NIST staff and postdocs to many pioneering accomplishments that have laid the foundation for high-speed spectroscopic imaging using broadband coherent Raman scattering. In 2004, his was the first group to demonstrate broadband coherent anti-Stokes Raman scattering (BCARS) microscopy. Since then, he has introduced numerous hardware and software improvements to the methodology. Among these, his group has engineered continuum laser pulses that were far superior for BCARS to those previously available and also devised a pulse-shaping approach that allowed us to obtain background-free (pure Raman) signal. He later invented a mathematical approach based on a Kramers-Kronig transform for retrieving the pure Raman spectrum directly from the raw CARS signal, making his the first group to obtain quantitative vibrational fingerprint spectra using coherent Raman methods in biological tissues or cells, and showing that BCARS was then 50-fold faster than spontaneous Raman imaging. During the same period Dr. Cicerone has directed a multi-PI R01 grant for stabilizing proteins in biopharmaceutical and drug delivery applications. Kacy Cullen is an Assistant Professor of Neurosurgery at the University of Pennsylvania and the Philadelphia VA Medical Center (http://www.med.upenn.edu/cullenlab/). He received a Ph.D. in Biomedical Engineering from the Georgia Institute of Technology in 2005, followed by postdoctoral fellowships in Neuroengineering at Georgia Tech and at the Center for Brain Injury & Repair at Penn. Dr. Cullen’s research program operates at the intersection of Neural Engineering and Neurotrauma. He is a leader in neural tissue engineering repair strategies, having pioneered novel “living scaffolds” for neuroregeneration, micro-tissue engineering to restore brain circuitry and biohybrid neuroprosthetic interfaces. Mark A. Davies received his B.A. in Chemistry from New York University. His Ph.D. thesis project topic was Raman Optical Activity, directed by Prof. Max Diem at the City University of New York. There followed postdoctoral work on infrared spectroscopic studies of acyl chain conformational disorder in lipids with Prof. Richard Mendelsohn at Rutgers University, work which was continued as a Research Assistant Professor in the Biochemistry Department at Georgetown University School of Medicine. Since then, Dr. Davies has concentrated on in vivo measurement of the efficacy of skin care products and cosmetics at Unilever, L’Oreal, and, presently, at Ashland Specialty Ingredients. Michael A. Davitz is both a physician-scientist and attorney. His practice focuses on creating value for clients through the development and effective enforcement of intellectual property rights. He is a registered U.S. patent attorney as well as a physician with over 15 years of experience in biomedical research, and more than 18 years of experience providing strategic counseling to clients in all aspects of intellectual property law. Michael received his J.D. from New York University in 1997, his M.D. from the College of Physicians and Surgeons at Columbia University in 1983, and his B.A. from Yale University in 1978. Prior to law school, he was an assistant professor of pathology and environmental medicine at New York University School of Medicine, where he was a Lucille P. Markey Scholar in the Biomedical Sciences. Following law school, he practiced law at the firms of Darby & Darby and White & Case. He then moved in-house as head of intellectual property for Taro Pharmaceuticals, a multinational pharmaceutical company. After Taro, he became a partner at Axinn Veltrop & Harkrider LLP in the biomedical group. He has published over 25 papers in peer-reviewed scientific journals such as Science and Nature. He is a regularly invited speaker on Hatch-Waxman and other patent issues with the American Conference Institute, Practicing Law Institute, IQPC and the Commercial Law Development Program of the U.S. Department of Commerce. He is conversant in Russian. Murat Guvendiren received his Ph.D. in Materials Science and Engineering from Northwestern University with a minor in Bioengineering. He was a postdoc in Materials Science and Engineering and Bioengineering Departments at the University of Pennsylvania. He joined Rutgers as an Assistant Research Faculty at the New Jersey Center for Biomaterials. His research interests include development of hydrogels and polymeric biomaterials, biomimetic material design, surface patterning, cell-biomaterial interactions; in particular cellular interactions with dynamic and patterned materials. His current research focuses on applications of 3D printing technologies to biomaterials and medical devices, including design of novel ink formulations. The applications of his research range from fundamental understanding of stem cell behavior using materials-based approaches to fabricating intelligent scaffolds for regenerative medicine. Frederick Halperin is Senior Scientist, Radiation Sterilization at J&J Sterility Assurance in Raritan, NJ, and is responsible for electron beam and gamma radiation processing, including sterilization dose setting, dose mapping, dosimetry systems, and maximum dose studies. He is the Particle Accelerator Safety Officer and assistant Radiation Safety Officer. Fred has contributed to publications on electron beam and gamma irradiation of polymers and pharmaceuticals. He is a member of the ASTM International Committee E61 on Radiation Processing, and is Co‐Chair of the Balloting Task Group. Scott Hanton is the General Manager for Intertek Allentown. Prior to his current role, he was the Laboratory Operations Manager and Chief Scientist in Allentown. He joined the Intertek network in 2010 as part of the outsourcing deal with Air Products & Chemicals. He earned a BS in Chemistry from Michigan State University and a PhD in Physical Chemistry from the University of Wisconsin-Madison. Scott has been active in polymer mass spectrometry and laboratory management. Hilton Kaplan is a Plastic, Reconstructive and Maxillofacial Surgeon, and a Biomedical Engineer. His research focuses on neurosciences (neural prosthetics and implantable man-machine interfaces), and tissue engineering (decellularized composite tissues for limb and face allotransplantation). Dr. Kaplan is Associate Director of the NJ Center for Biomaterials and a Research Associate Professor at Rutgers University; and an Adjunct Professor in Regulatory Science at the University of Southern California. Dr. Kaplan has held various clinical and research positions in industry, including Senior Medical Director at Allergan (Fortune 500 healthcare) and Vice President of Clinical Sciences at LifeCell (pioneered decellularizing dermis). He has a long history of passionately advocating for burn prevention and reconstruction (as a burn surgeon, a founding board member of the non-profit Grossman Burn Foundation, and the adoptive father of a spirited burn survivor), and for craniofacial reconstruction (as a founding director of the non-profit Look-at-Us Alliance for Craniofacial Differences). Robert A. Latour obtained his Ph.D. in Bioengineering with an emphasis on biomaterials from the University of Pennsylvania in 1989. He then accepted a faculty position in the Department of Bioengineering at Clemson University, where he presently serves as the McQueen-Quattlebaum Professor of Bioengineering. Prof. Latour’s research focuses on the study of interactions between proteins and surfaces, with a specific focus on the development of molecular modeling and simulation methods to predict, visualize, and understand these interactions at the molecular level. He has published over a 100 book chapters and journal articles in the field of biomaterials. Prabhas Moghe is a Distinguished Professor of Biomedical Engineering of Chemical and Biochemical Engineering at Rutgers University. Dr. Moghe received his Ph.D. in Chemical Engineering from the University of Minnesota in 1993, and trained on a postdoctoral fellowship in Bioengineering at Harvard Medical School from 1993 to 1995. He joined the Rutgers faculty in 1995 where he has held several research leadership roles including Vice-Chair of Biomedical Engineering, PI and Director on the NSF-sponsored IGERT program at Rutgers on Integratively Engineered Biointerfaces (2003-) and Integrated Science & Engineering of Stem Cells (2008-13); PI/Director of a Nanoscale Interdisciplinary Research Team (NIRT) (2006-2012); Director of Rutgers-UMDNJ Joint Graduate Program in Biomedical Engineering (2007-2010); CORE PI for NIH-sponsored Integrated Research Center on Polymeric Biomaterials (2003-2018); and School of Engineering Diversity Champion for the NE-AGEP (2005-). He was appointed as graduate faculty member of the Graduate Program in Cell and Developmental Biology (Molecular Biosciences) at Rutgers in 1998. Since 2008, Dr. Moghe has been Adjunct Professor of Surgery, Division of Bioengineering, Robert Wood Johnson Medical School. Dipanjan Nag is the CEO and President of IP Shakti LLC, a pre-eminent patent advisory and commercialization advisory service. He was previously the Executive Director, Office of Technology Commercialization at Rutgers University. Dr. Dipanjan Nag was a Vice President at ICAP Ocean Tomo an intellectual property transaction firm, a subsidiary of ICAP Plc. He concentrated on private sale of biotechnology and life sciences technology areas at ICAP Ocean Tomo. Before that he was a Director at Ocean Tomo, an intellectual property merchant banc, responsible for private sale, patent auctions and valuation of intellectual property assets. Dipanjan also brings with him a wealth of academic technology transfer experience. He was the Director of Operations in the Office of Technology Development at the University of Nebraska-Lincoln (UNL) prior to joining Ocean Tomo. Dipanjan was responsible for successfully licensing numerous technologies and several spin out companies from the University including the major licensing deal with The Monsanto Company for a biotechnology invention. Judith E. O’Grady is the Corporate Vice President of Global Regulatory Affairs for Integra LifeSciences Corporation. Ms. O’Grady has worked in the areas of medical devices and collagen technology for over 30 years. During her career she has held positions with Colla-Tec, Inc. a Marion Merrell Dow Company, Surgikos, a Johnson & Johnson company, and was on the faculty of Boston University College of Nursing and Medical School. Ms. O’Grady led the team that obtained approval from the Food and Drug Administration (FDA) for INTEGRA® Dermal Regeneration Template, the first skin regenerative product approved by the FDA, DuraGen® Dural Graft Matrix, DuraGen Plus® Dural Regeneration Matrices, and NeuraGen® Nerve Guide, as well as over 500 FDA and international submissions and approvals. She has been an integral part of the regulatory due diligence process on many of Integra’s acquisitions, is a published author, and is listed on the patent for the DuraGen® Dural Graft Matrix . Ms. O’Grady has presented both nationally and internationally on regulatory and compliance issues. She received her B.S. degree from Marquette University and M.S.N. in Nursing from Boston University and has Regulatory Affairs Certification. Jean E. Schwarzbauer, Ph.D is Professor and Associate Chair of Molecular Biology at Princeton University. She received her Ph.D. from the University of Wisconsin and was a post-doctoral fellow at MIT before joining the Princeton University faculty. She has a long record of service including ASMB President, ASCB Secretary, editor of major cell biology journals, and membership on many advisory boards and grant review panels. Dr. Schwarzbauer has organized conferences in cell and matrix biology and bioengineering. At Princeton, she teaches cell biology and conducts NIH-funded research in tissue repair and regeneration, cancer, and stem cell biology. Cathryn Sundback , Sc.D. is an Assistant Professor at Harvard Medical School, Director of the Laboratory for Tissue Engineering and Organ Fabrication at the Massachusetts General Hospital, and the Director of the Biomaterials Core within the Center for Regenerative Medicine at the Massachusetts General Hospital. A biomaterialist by training, Dr. Sundback has considerable expertise in the biocompatibility of synthetic and natural biomaterials. Her research focuses on the application of these biomaterials for tissue engineering of facial and limb tissues, particularly peripheral nerve, skeletal muscle, cartilage, and bone. She is currently developing engineered skeletal muscle and cartilage tissues as clinically translatable models and as in vitro models for drug discovery. Dr. William J. (Bill) Welsh holds the Norman H. Edelman Endowed Professorship in Bioinformatics in the Department of Pharmacology at the Robert Wood Johnson Medical School (RWJMS), Rutgers University in Piscataway NJ. Concurrently, he serves as Director of the Division of Cheminformatics in the Biomedical Informatics Shared Resource at the Rutgers-Cancer Institute of New Jersey (R-CINJ). Previously Dr. Welsh was the Founding Director and Principal Investigator of the EPA-supported Environmental Bioinformatics and Computational Toxicology Center. He also previously served as Founding Director and Principal Investigator of the Informatics Institute at the University of Medicine & Dentistry of New Jersey (UMDNJ, now Rutgers). He is a member of various centers and institutes of excellence at Rutgers University, including the Cancer Institute of New Jersey, the New Jersey Center for Biomaterials, the College of Pharmacy, and the Environmental & Occupational Health Sciences Institute (EOHSI). Pamela C. Yelick, Ph.D. is a tenured Full Professor in the Department of Orthodontics, and Director of the Division of Craniofacial and Molecular Genetics at Tufts University. Yelick Lab grant support from NIH/NIDCR, NIH/NIAMS, AFIRM/DoD and Osteo Sciences Foundation is being used to study mineralized tissue development, disease and regeneration. Dr. Yelick is internationally recognized as a leader in dental tissue engineering and craniofacial development. Current efforts to bioengineer coordinated bone and tooth constructs are anticipated to result in improved methods for functional craniofacial reconstructions.